HovCov Year-Round, Outdoor HVAC Covers. Extend the life of your HVAC system by protecting from debris and rain. HovCov Year-Round, Outdoor HVAC Covers. Extend the life of your HVAC system by protecting from debris and rain. Protect your Air Conditioner, heating unit, and heater. AC protection from debris. The HovCov™ is a year-round, HVAC cover designed to protect outdoor air conditioning or heat pump units. Air conditioners and heat pumps are costly investments that are susceptible to damage from leaves, pollen, rain, ice, snow and more. The HovCov™ outdoor air conditioning and heat pump cover will protect your HVAC unit from accumulating debris and rust, extending its overall life and saving you money. Start protecting your air conditioner and heat pump today! Protects rain and debris from entering through the top fan opening. HovCov™ Air Conditioner and Heat Pump cover floats above your unit when running. As air vents through the opening, your unit is protected from debris, rain and snow. 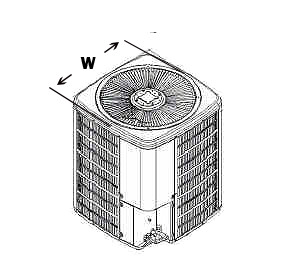 When the unit is dormant, the HovCov™ covers the fan opening, protecting the unit from debris. The straps can be adjusted and pulled tight when the unit is not in use for long periods. The HovCov™ is designed to protect and cover the fan opening on the top of your A/C unit or heat pump. Select a HovCov™ that is slightly larger then the fan opening. This will allow for the HovCov™ to cover as much of the fan as possible when the A/C unit or heat pump is turned off. Debris and UV rays in the summer, and snow and ice in the winter can damage your air conditioner or heat pump. Extend your investment's life with the HovCov™ HVAC cover. The HovCov™ is available in three sizes, with diameters of 23", 28", and 32" available to fit almost any size air conditioner or heat pump. Simply clip the adjustable straps to the grates on the four sides of your Air Conditioner or heat pump and allow approximately twelve inches of slack. High quality UV and weather resistant material double sown with UV resistant thread, mounted on a galvanized steel ring, all made in America.